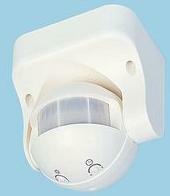 A Passive Infra-Red (PIR) sensor is an electronic device commonly used in security lighting, and burglar alarm systems. A PIR sensor is a motion detector which detects the heat (infrared) emitted naturally by humans and animals. When a person in the field of vision of the sensor moves, the sensor detects a sudden change in infrared energy and the sensor is triggered (activated). At the front of a PIR sensor unit is a fresnel lens (pictured above). This special kind of lens is used to gather light from a very wide field of view and focus it directly onto a passive infrared sensor (as shown below). Some electronics inside the PIR sensor unit then decide whether the infrared light detected is from a warm moving body, and if so, triggers a switch. The commonest use for a PIR sensor is automatic security lighting. Whenever a suitably large (and therefore probably human) warm body moves in the field of view of the sensor, a floodlight is switched on automatically and left on for a fixed period of time – typically 30-90 seconds *. This can be used to deter burglars as well as providing lighting when you arrive home at night. * The duration the light is left on for can usually be set by the user. 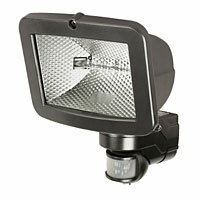 Such PIR security lighting systems are available from a wide range of sources from as little as £10.00 up in the UK. The vast majority of commercial PIR sensor products are built to run on 240 VAC mains electricity. This makes them unsuitable for most renewable energy powered systems such as motion activated CCTV systems in remote locations. Although a power inverter can be connected to the RE system battery bank to obtain the necessary voltage, using it for 24 hours per day for such as small load would be a huge waste of energy. Fortunately 12 Volt DC powered PIR sensor units are available. 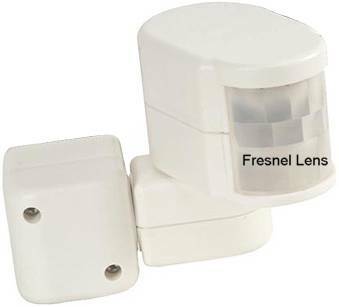 These (such as this 12V PIR sensoravailable in our REUK Shop and pictured above) can be connected directly to a 12V battery or battery bank, and used to trigger a Relay when motion is detected. The relay will switch on/off a light or any other 12VDC or even 240VAC device if required. If a power inverter is necessary to power a 240 Volt device switched on by the PIR sensor, then the inverter can also be turned on as and when required rather than needing to leave it on 24 hours per day. This saves a considerable amount of energy. This PIR sensor will run off 10-14 Volts DC electricity and draws a current of under 10mA. 12 Volt PIR Sensors do not usually include a built-in timer. Therefore, it is necessary to put together a very simple circuit so that whatever device is connected to the PIR sensor will stay switched on for the desired length of time. 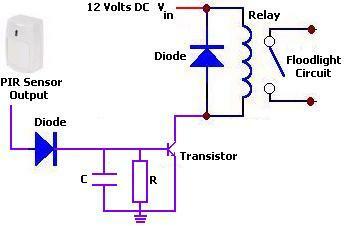 The circuit shown above will turn on a floodlight or other device for a time in seconds approximated by the value of the capacitor C (meaured in microFarads) multiplied by the resistor R (measured in megaOhms) multiplied by 0.75. For example, if R = 1M and C = 22uF, the floodlight would remain lit for around 16 seconds after the PIR sensor switched off. Full details and plans for PIR Sensor Circuits are now available by clicking here. We also have completePIR Relay Timers available now in the REUK Shop. 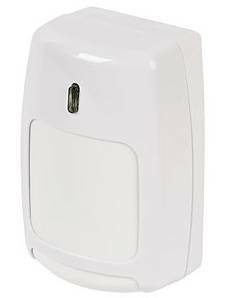 NEW An alternative type of PIR sensor module is now presented here: KC7783R PIR Module, better suited to many standalone motion detecting designs than the burglar alarm type PIR sensor discussed above. In order for a PIR sensor to work well most of the time, they are designed with certain limitations. A PIR sensor cannot detect a stationary or very slowly moving body – if the sensor was set to the required sensitivity, it would be activated by the cooling of a nearby wall in the evening, or by very small animals. Similarly, if someone walks straight towards a PIR sensor, it will not detect them until they are very close by. PIR sensors are temperature sensitive – they work optimally at ambient air temperatures of around 15-20 degrees Celcius. If the temperature is over 30 degrees, the field of view narrows and the sensor will be less sensitive. Alternatively, if the temperature is below 15 degrees, the field of view widens and smaller or more distant objects will activate the sensor. I read this article on your website. I also bought one of these timers and followed your instructions (Convert Digital Mains Timer to Low Voltage). Using the info I learned from the timer, I converted one of these (pictured above) for 12V use ES34 External PIR Light Controller. We’ve been using this particular make of PIR for years and they are long lasting and 180 degrees. The conversion is just the same as you did with the timer. Using this PIR instead of the Honeywell IS-215T means that you still get to use the PIR onboard timer and photocell as normal. I’m just a hobbyist so my knowledge is limited, but as the rectifier in the PIR has 22v Zeners, it’s likely that it will work with 24v as well. I did test it at 36v and 24v and it worked. It’s currently been working away fine on 12v for about a month now. I use it to trigger CCTV recording. I did use the Honeywell (good choice on your part – we’ve been using them for over 10 years on out Alarm Systems, with only one failure). I used a Honeywell initially for external use but found it to be not quite sensitive enough and sometimes didn’t trip. I think the Honeywell is less sensitive in order to minimise false alarms. False triggering an external light isn’t so much of a nuisance so I think that these external PIR’s are more sensitive.